That inspired Steinbeck and Jack's seminal road trip? for each who wanders her way. GREAT poem. The road means many things to many people and some get to share that feeling with the rest of us. You might want to add some music and turn this into a song. Now I understand what you mean when you describe yourself as a roadie. You too have felt the lure of the Mother Road. 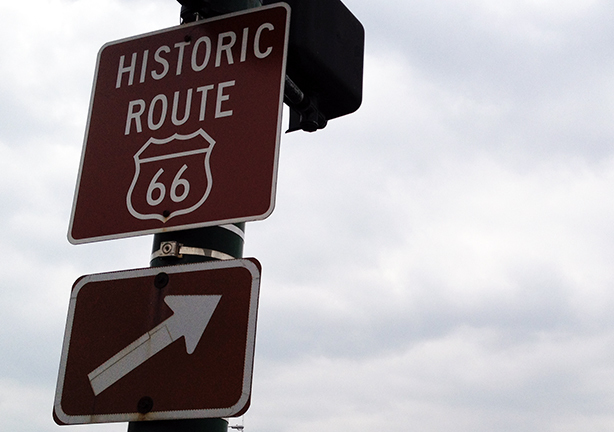 I enjoyed checking out your Route 66 site and feel free to set the poem to music. I myself am tone deaf. Thanks for the kind words and link to dVerse, Victoria. It's been a while since I've bellied up to the bar. There is always some great poetry to be found at dVerse and your prompt this week does match the nature of this poem.